When Eric Marcus was fired days before his 56th birthday, he was without purpose. “It’s not easy to get a job-job at 56,” he told me. This was three years ago. Today, as he rings me from New York, is his 59th birthday. As Marcus' team began cutting down the three-hour interviews into 10-minute slots, they found they ran like podcasts. Marcus had his A Beautiful Mind moment then and there. Three years on, Making Gay History is a podcast that tallies-up views from over 206 countries and territories and regularly hits the best-of podcast lists. With the paucity of queer historical texts that aren’t locked-up by library membership cards or JSTOR log-ins, Making Gay History offers a dust-free archive that gives queer histories the consideration they’re ineffably overdue. Making Gay History shares its name with a book that Marcus wrote back in '92; a nonfiction account of five decades of the gay civil rights movement. With the book laying the groundwork, Marcus and his team take the transcribed tape recordings used for it and lift them into the online age. Now in its fourth season, each episode dives deep into the lives of forgotten figures from the LGBT+ civil rights movement. Episodes include first-person interviews with figures like Sylvia Rivera, a trans activist vital to the Stonewall Riots, and Vita Russo, author of The Celluloid Closet: Homosexuality in the Movies and a co-founder of both ACT UP and GLAAD. Tailing this, I emailed my old lecturer, Mark Turner. A professor at King’s College London, Mark is the course convenor of Critically Queer, a final year English Literature module that rescinds the hetero from the lesson plans. Offering in its place the writings of queer academics such as Judith Butler and a range of politico-historical moments; from Harvey Milk to ACT UP. This is a sentiment similarly expressed by Marcus, who, when first writing his book, noted the initial struggle of there being “very little out there that had been published on queer history. “There was no place to go to for a timeline of the movement." The task of creating a queer timeline is decidedly intimidating, but Debra Fowler and her team are up for the challenge. Fowler is the co-founder and executive director of History UnErased, an initiative to bring queer histories into American classrooms. It was Debra who first contacted Marcus about his archives; the queer history industry sure is a small one. Leaving a teaching career two and a half years ago, Debra today is aiming to create "a more just harmonious world. "Every young person deserves and needs a more accurate reflection of our shared story,” she said. But sometimes, this shared story becomes dominated by certain groups. Certain voices. Inflections. Registers. In 2015, Roland Emmerich’s Stonewall was slammed by critics and audience alike. The fictional account of the riots minimised activists Marsha P. Johnson and Sylvia Rivera and replaced their role and labour with a white male mannequin. Their histories effectively erased to new generations. After the feat of marriage equality, white gay cis men found their identity arguably smoothed into the mainstream. But by making just one shade of a colourful community the norm, it’s made it even more difficult to tell queer stories and have them recognised. When a subculture becomes the movie strapline ‘Based on the true story… ‘, how their story is told is as important as the cash its movie adaptation grosses. After questioning whose stories get told and how we tell them, you quickly encounter a range of productive queer media in the past few years. Call Me By Your Name and BPM (Beats Per Minute) have both drawn critical acclaim while foregrounding queer lives in different periods. Dustin Lance Black’s When We Rise was an eight-hour miniseries which chronicled turning points of the queer rights movement. The Lesbian Historic Motif Podcast is a monthly show that interviews an author of historical fiction that features queer women. Alan Hollinghurst, a gay author whose novels often explore queer lives at various historical junctures, dropped his sixth book, A Sparsholt Affair, last year. Instagram accounts such as @lgbt_history or @theaidsmemorial have become digital archives of queer activism across the decades at a time where, still, physical archives of queer history remain as non-existent as objectivity in a David Lynch film. If we pause and take stock, it’s impossible to ignore the intrigue in history that has eclipsed the apparent acceptance of queer people. Whether for education or entertainment, by mining the past it allows us to bridge to the present. 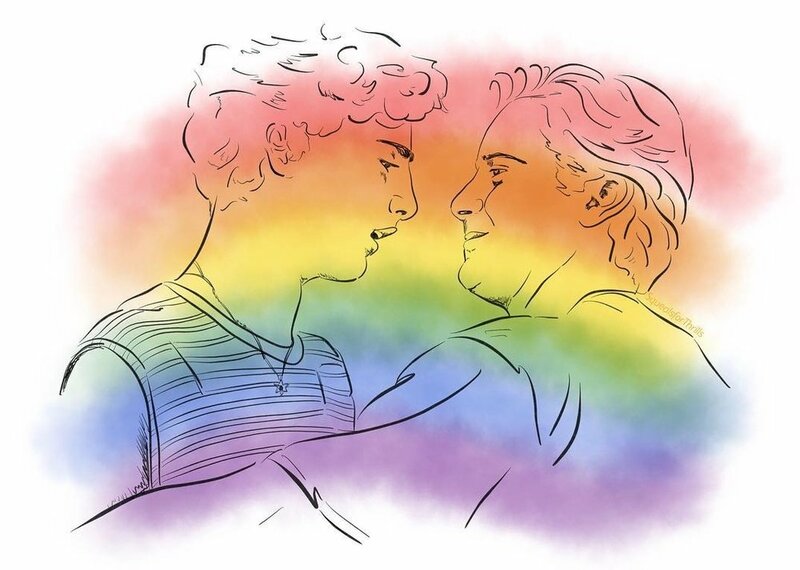 There is a growing urgency and demand for a queer timeline that only queer people themselves can provide, and queer folk today have increasing access to the stories and figures who shaped LGBT+ society. Though some efforts serve to sterilise and whitewash, they are all part of an effort to make inequality a thing of both the past and television screen.